The Japanese put on a show of force at the Tokyo Motor Show. 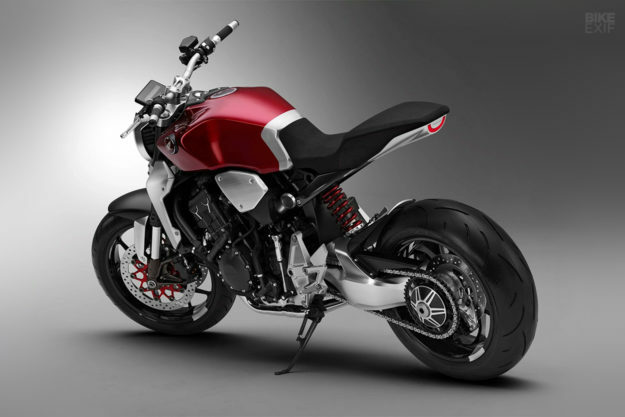 Honda tore the wraps off its new Monkey and ‘Neo’ cafe racer concepts. Yamaha revealed an oddball three-wheeler. 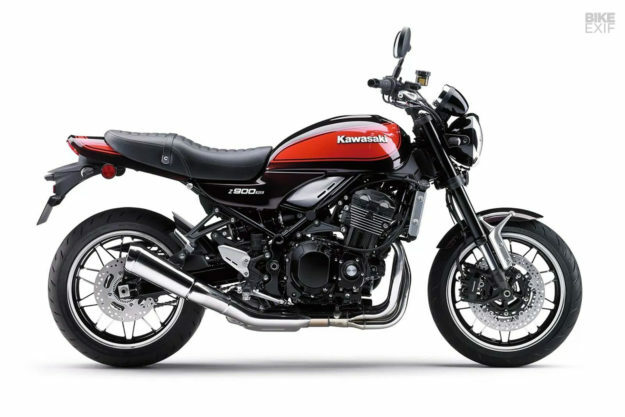 Suzuki showed a tasty potential SV650 variant, and Kawasaki set the interwebs alight with the Z900RS. Which one would you pick? 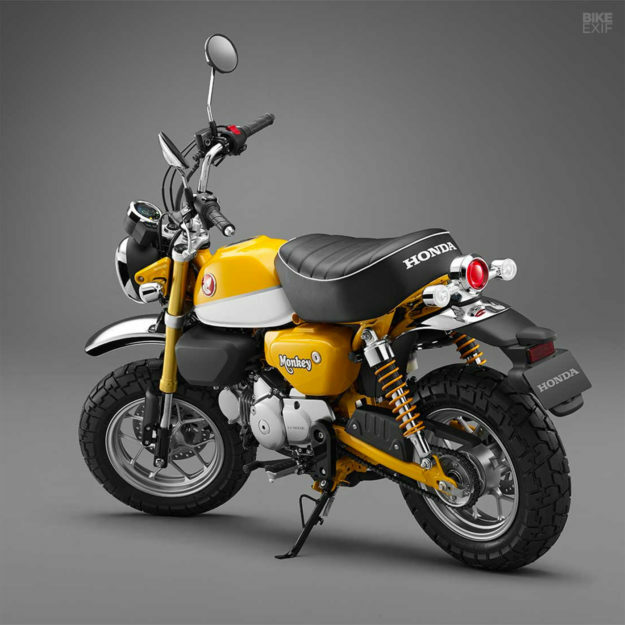 Honda Monkey 125 concept Built around the same 125cc thumper found in the insanely fun Grom, the refreshed Monkey is a modern throwback to Honda’s mini-bikes of yore. And let’s be honest: it absolutely defines radness. 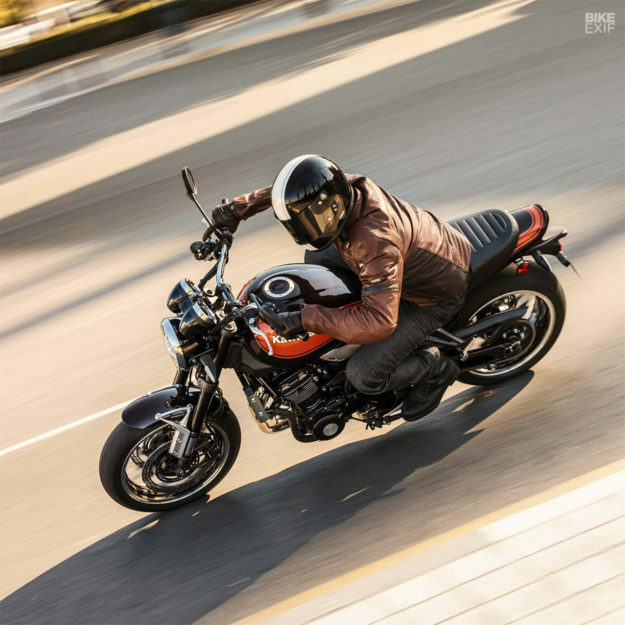 The concept stays true to the original Z-series styling and promises to make riders look as ridiculous as ever, although it has been modernized a touch—with a hat tip towards the scrambler movement. 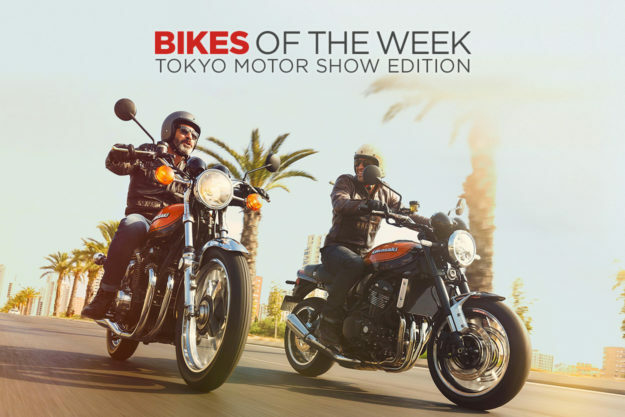 2018 Kawasaki Z900RS After teasing us with video snippets over the past few months, Kawasaki finally revealed the Z900RS in Tokyo. And mouths around here are watering. Harkening back to the mighty Z1, Team Green’s new retro ride is a Universal Japanese Motorcycle version of their Z900 streetfighter with squeaky clean lines and a honey of a power plant. In RS guise the 948cc inline-4 has been remapped to deliver a beefier bottom end, which has trimmed peak horsepower to 111 (from 123) but keeps it competitive against the Yamaha XSR900. Other mechanical changes include a shorter first gear for extra squirt at the lights, and a longer final drive to quell buzziness on the interstate. The trellis frame is new and the radial-mount binders up front are a welcome upgrade. Suspension is a carryover from the streetfighter platform, with full adjustability at front and rear. Yamaha obviously doesn’t feel the same way. 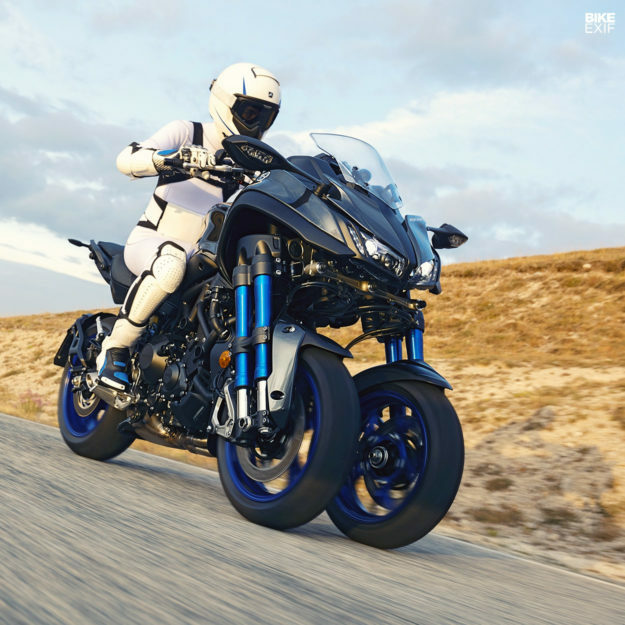 Looking like a Piaggio MP3 with a steroid and amphetamine addiction, the Yamaha Niken is a ‘Leaning Multi-Wheeler’ that, believe it or not, is a production bike thing vehicle. 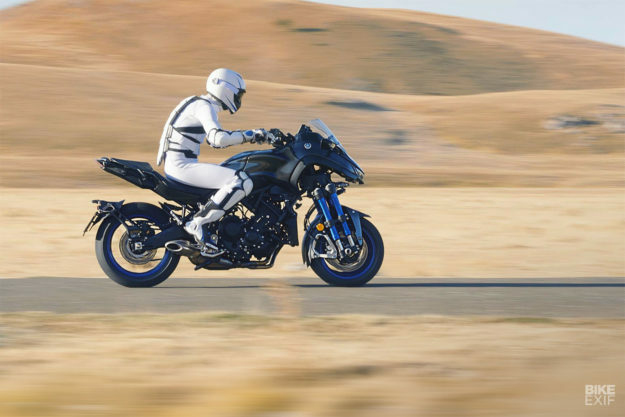 Powered by the same sonorous triple found in the XSR900, the Niken is clearly pitched at performance-minded riders with a Michael Bay fetish who’d prefer not to grind a knee-puck. And they won’t have to, thanks to a front end that is both confusing and incredibly awesome. It consists of a pair of 15-inch articulating wheels that are suspended by a set of dual-tube, USD forks, each with a floating disc on their outer side. The width up front is 885mm, which should mean those hoops will probably track awkwardly on anything but silky smooth pavement, making it a bit of a workout to ride. Which I will gladly attempt, if Yamaha will have me. In the name of science, of course. 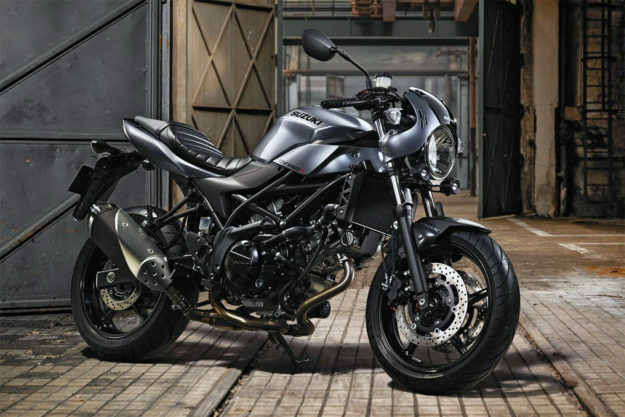 Suzuki SV650X concept Not to be outdone by its countrymen and rivals, Suzuki is also looking to dip a toe in the retro waters with a cafe version of their SV650. 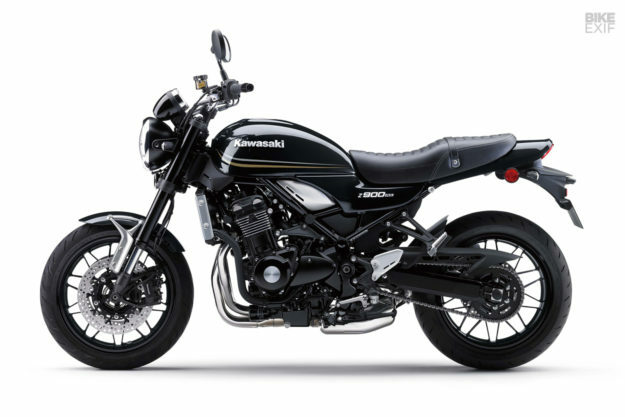 The SV650X, as it’s called, is an evolution of last year’s Rally concept that got people talking about the little Suzi in a good way. 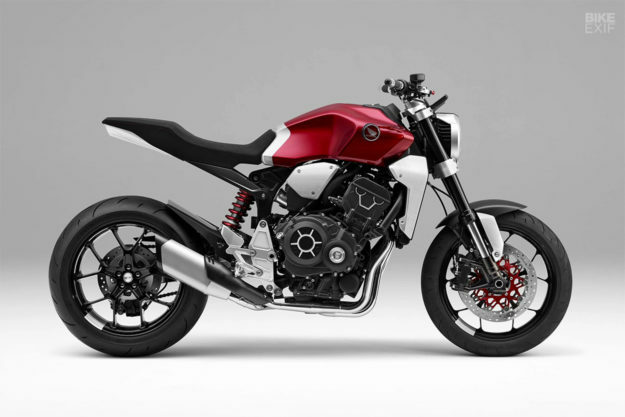 This time around, the concept loses the Rally’s 80’s nostalgia and instead captures the look of a slightly customized first-gen, naked SV. And that’s not a bad thing at all. There are clip-ons up front, and that tidy fairing looks as close to a factory product as I’ve ever seen. The tuck-rolled seat already exists in the Suzuki accessory catalogue so unless those mini fog lights are constructed from Unobtanium, I’m unsure as to why the concept tag is still being applied. The hope is that this thing makes it out of the Tokyo Motor Show and onto showroom floors: it would be a perfect retro styled ride for beginners and those of us not looking to achieve warp speeds. The SV platform has always been a good one: it’s priced right, performs well and looks great with a bit of kit. 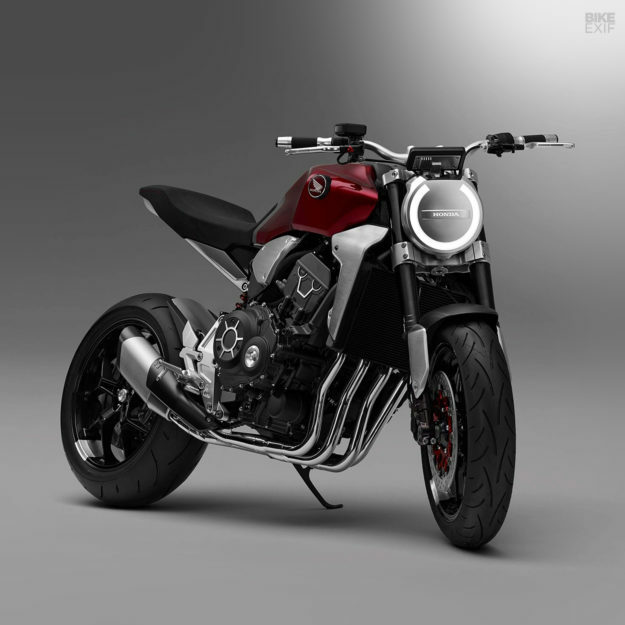 Honda Neo Sports Cafe concept Proving that the UJM bug is biting all brands, Honda also debuted its Neo Sports Cafe concept at the Tokyo Motor Show. 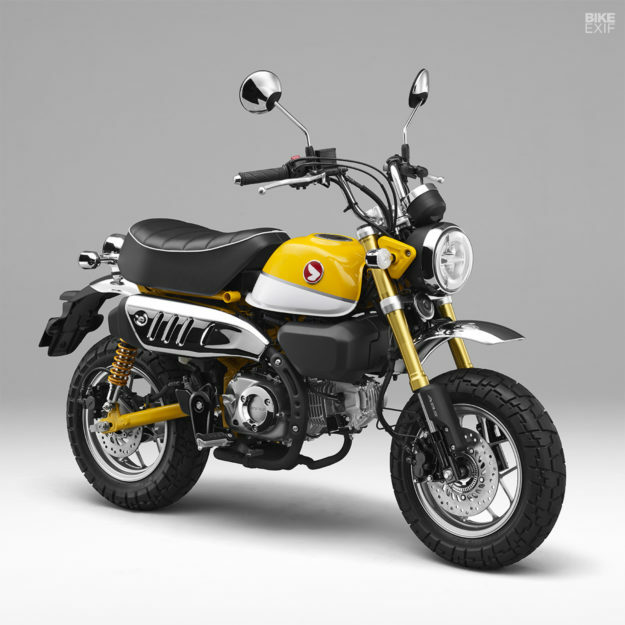 The design is reminiscent of the CB4 Concept that dropped at EICMA back in 2015, but with a much stronger retro nod. And it’s easily Honda’s prettiest work of recent years. Powering Big Red’s cafe racer is a re-tuned version of the 999cc engine that powered previous generation CBR1000RRs around the racetracks of the world. That means horsepower figures should slot into the 105-115 range—which is the sweet spot for the bikes of this ilk. The selvedge denim and Red Wing crowd might find the design language a little too ‘Neo’ for their tastes, but I’m hoping Honda stays true to this iteration. The lines on the sculpted tank are gorgeous to my eyes, and the rear perch is picture-perfect.